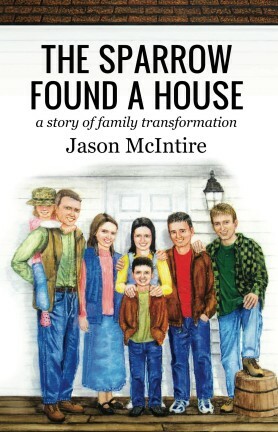 Elisha Press, publisher of The Reunion, a book that I reviewed here last year, contacted me recently and asked that I review their latest publication, The Sparrow Found a House: a story of family transformation by Jason McIntire. Thrilled at the opportunity, I agreed. I told my older girls, 8 and 10, to read it, and after a week or two, asked what they thought. They both hadn’t finished it. Curious what the problem was, I read it. Turns out, it was a little over their heads. The story line was great, and definitely nothing they shouldn’t be reading – but I’d estimate a good age range to be high school and adult. I thoroughly enjoyed the story and so appreciate the morals presented. With things like violent video games, modesty, money, and friendships addressed, it was spot-on with Biblical truths in a great story format that never feels like preaching. The story spotlights 15 year old Jessie Riviera. Her mother, a widow, has recently remarried, and the man she’s chosen is Jessie’s worst nightmare. He has ideals for the family they haven’t had to live up to, and worse yet, Jessie’s three siblings are completely won over by the changes made. They begin homeschooling, deal with a less-than-thrilled grandmother, and attempt to adjust to life with a father figure once again. The Sparrow Found a House is available here for $12.99. For a big (little) family readers, coupon code BALES6313 will take $4.00 off the $12.99 regular price. It is good through May 2014. In a very cool move, Elisha Press offers the e-versions of their books free at this website, or for the lowest available price Amazon offers ($.99) delivered directly to your Kindle. I’m so impressed by this publisher and their motivations to provide great reading materials to the public, I really encourage you to check them out and spread the word! Disclaimer: Elisha Press provided me with the 203-page paperback, free of charge, for the review. All opinions expressed in this review are mine.